Sunday morning. Memorial Day Weekend, 2011. I am sitting on the sofa in my living room. Outside the closed shades is a sky dark and gray with rain. Thunder grumbles. I take a sip of my hot coffee and stretch my toes. Breakfast is ready except for the quiche baking in the oven, I’m warm and comfortable. And Mike is folding laundry. In revealing what I am about to share, I will likely be showing myself to be an easily entertained simpleton. So be it. The truth is, I love watching Mike do laundry. I’ve never seen anything like it (well, except the other times I’ve sat enthralled while Mike folded). I pull clothes out of the dryer, often after they’ve sat there for days. Already hopelessly wrinkled, I hold each item up, twist it, turn it, put it in a pile in a shape reasonably approximating “folded”. Mike removes them immediately from the dryer, divides the clean load into items which will be folded in a similar manner. Each piece is shaken out, then laid carefully on the floor, wrinkles smoothed, then folded in crisp one-at-a-time folds. T-shirts are perfectly square packages which will fit perfectly into their cubby in his closet. Towels and pillowcases each have their own style of fold, and I love watching the ordered piles of clean laundry build on the floor in my living room. Flat sheets are crisp, fitted sheets make neat, flat piles – elastic, rounded corners pose no obstacle to Mike’s skills. Bedding gets stacked in sets so that there will be no searching through a messy pile for a matching pillow case. While Mike folds, we chat idly about the weekend, or about the laundry itself. I could tell you about Mike’s undershirts…but then I’d have to kill you. I think Mike enjoys these moments as much as I do. When you live alone, as we both do, these humble household tasks are undertaken without much thought and always in a solitary fashion. Company makes them pleasant in a way that they never are otherwise. Also, laundry folding is usually at the end of our shared time together, when neither of us feels compelled to fill the moments with deep conversation or frenetic activity. When we have settled into an easy companionship and are savoring it before we go our separate ways again for months. 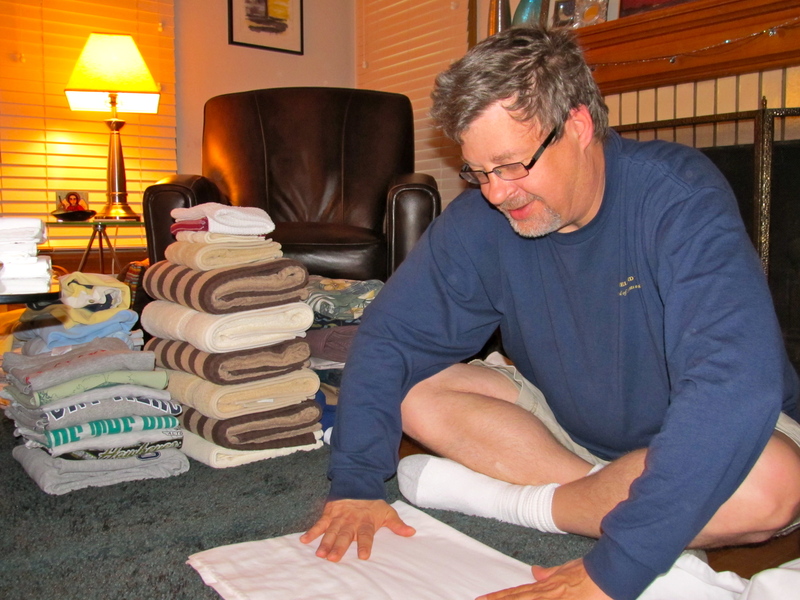 Mike folds a pillow case beside piles of clean laundry, and loves that I am snapping a photo! I must tear myself away from Mike and his laundry to pull the individual quiches from the oven. Another thing I love about having company for the weekend is the opportunity to cook for someone other than myself. I always try new recipes, rather than stick with tried and true – there’s an element of risk, but I know Mike won’t mind if the results are disastrous – he’s sick of solitary meal preparation at home, too! 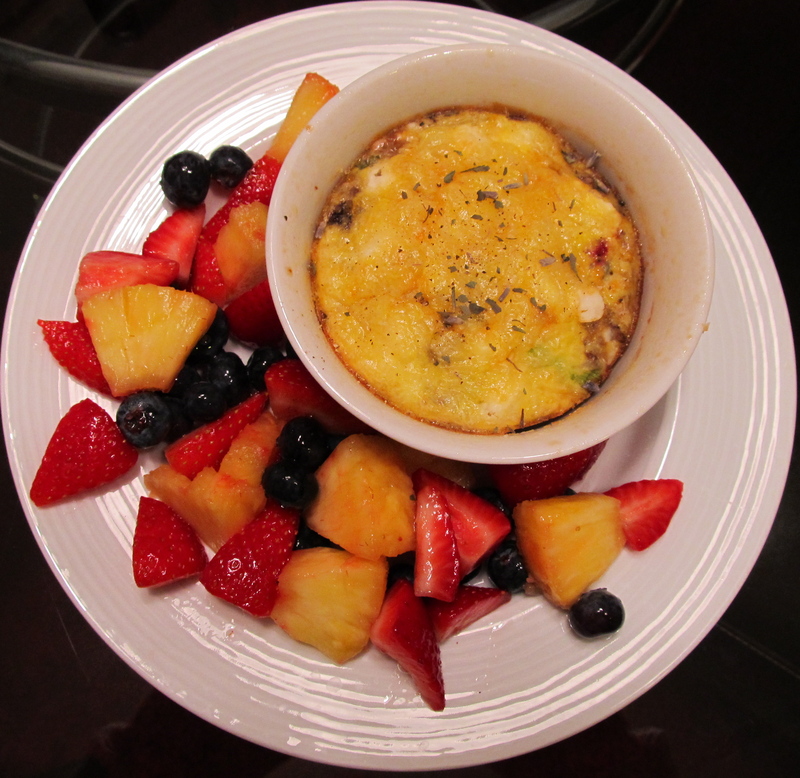 My breakfast menu for today: individual quiches, fruit salad with vanilla yogurt, hashbrowns. The quiche uses herbs de provence, which I have not cooked with before. As the herbs saute with the vegetables, their fragrance fills the house. (As always the recipe is included on the recipes tab on this blog). Too bad you can't see the delicious veggies and goat cheese filling the quiche! Yum. After we eat, we load Mike’s van and he departs for Minneapolis. I am not a fan of that first half-hour after company leaves – the house is quiet, I’m tired, and living alone suddenly feels terribly lonely. But that moment passes, and I am able to luxuriate in my still-clean house and my refrigerator stocked with tasty leftovers. Besides, I’m pretty sure that if I play my cards right, I’ll live to see Mike fold another day!